Unique days and special accomplishments are hard to come by for football programs as storied as the University of Miami’s. But Saturday brought something special to the city. Miami’s campus exuded a special energy of school spirit unlike one it has felt in years. From as early as 3 a.m. Nov. 11, hundreds of animated fans gathered and waited in line near the Lakeside Patio, awaiting ESPN’s College GameDay’s first visit to Coral Gables. 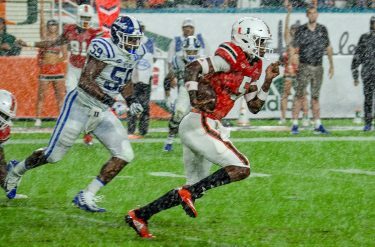 This enthusiasm ran through UM all week, and it culminated in the Miami Hurricanes’ best performance in more than 15 years on Saturday night, when they steamrolled the No. 3 Notre Dame Fighting Irish 41-8. While the victory was clearly impressive, it wasn’t necessarily a surprise to many Canes fans and team members who witnessed a dominant performance against Virginia Tech on Nov. 4. On the other hand, a vast majority of the media and college football analysts didn’t have many positive things to say about Miami, despite its undefeated record. Meanwhile, the praise for Notre Dame was hard to miss. Whether on TV, the internet or social media, nearly every expert gushed about the turnaround head coach Brian Kelly orchestrated during the Fighting Irish’s offseason and applauded the physicality of their all-world offensive line. 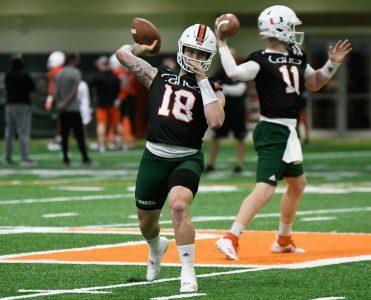 These lopsided sentiments and predictions prior to a top-10 showdown seemingly struck a nerve with Canes players. This extra edge was most evident in the play of Miami’s defensive line, which made Notre Dame’s offensive line look like it belonged on a high school gridiron rather than playing in primetime on Saturday night. In addition to recording nine tackles for loss, five sacks and forcing four turnovers, the Hurricanes limited Fighting Irish running back and Heisman Trophy candidate Josh Adams to just 40 yards on 16 carries. 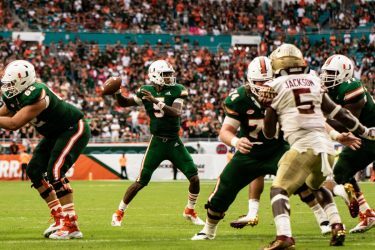 On the other side of the ball, Miami’s offensive line opened up gaping holes that allowed Travis Homer, DeeJay Dallas and Rosier to rack up 237 yards on the ground. After such a dominant performance, UM won’t have to worry about muting the doubters and naysayers during the last month of the season. Legendary former Miami coach Jimmy Johnson most likely enjoyed watching the Hurricanes silence the critics. After all, even he had to deal with a similar situation during his tenure. However, he’s not ready to confirm Berrios’ statement. UM has that goal in mind, and it will take until early January to find out if the team will achieve it.